The Naruto manga may have ended, but you wouldn’t know it with the work Masashi Kishimoto has been doing since the manga’s end. Kishimoto has continued to draw and create content for the Naruto universe and has even made a rare U.S. appearance at the recent New York City Comic Con. No doubt he has been quite busy! One of the side projects Kishimoto embarked on was a beautiful art book filled with high quality drawings entitled Uzumaki Naruto: Illustrations. 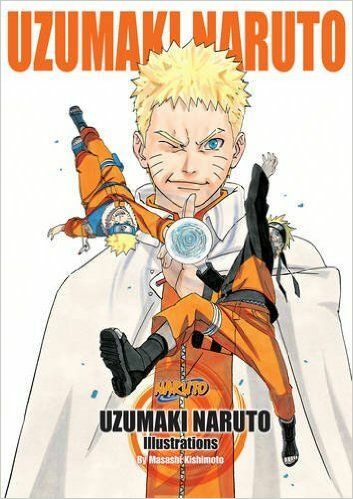 The book itself has an orange front and back cover with the front sporting the Uzumaki Naruto name and the back being the symbol of the Uzumaki clan in light orange. The cover is encased in a dust jacket with a large picture of Naruto as the Hokage on the front alongside two smaller versions of him as a child and as a teenager (see the image above). The back cover gets the same treatment, but with Sasuke. When you open up the art book, the first thing you’ll see is a decal sheet on very high gloss paper. You can peel these decals out and stick them wherever your heart desires, or you can preserve them and just not do anything with them. Turning the page you get another bonus in the form of a double-sided poster. On the first side you get Naruto and Hinata with Tonori (from The Last –Naruto: the Movie-) and on the opposite side you get Naruto, Sasuke, and the Sage of the Six Paths. After that you get 94 pages of different illustrations. These illustrations depict either certain moments from the series or just the characters in different artistic styles. Some illustrations were made with water color, some look like stained glass, a couple look like colored pencil sketches, some look like renders, etc. There is a wide variety of styles used throughout the art book in order to depict Naruto and all of the characters in different ways. Practically everyone throughout the series was featured in the book giving it some amazing variety. Each illustration is also printed out on glossy paper making all of the colors pop and stand out even more! The final pages of the book contain illustration commentary from Kishimoto himself as well as a countdown of his top ten personal favorite illustrations. It ties a nice little bow on this amazing art book that any Naruto fan should have. Uzumaki Naruto: Illustrations is available through VIZ Media for $19.99. If you are interested in the book yourself, you may purchase it here. Be mindful that the book has a November 3, 2015 release date so depending on when you are reading this review, it may be available now or available for pre-order. A copy of this art book was provided for review.